Long Beach, Long Beach, Long Beach - you are a treasure chest of restaurants, plenty of which are in close proximity to another, making it difficult to decide on where to go when a nearby sign so temptingly calls out with, "Amazing food here!" That being the case, we've visited The Federal Bar several times before, starting in 2013, because it's guaranteed to be a fun time from the old bank and era decor to the craft beers to the hearty, satisfying food. However, with so many other joints popping up in Orange County over the years, it's been a while since our last visit so we jumped on the opportunity to see what's new on their lunch menu when an invitation came. I wanted to take a peek at what they had in the realm of salads since that's usually what I crave for lunch. 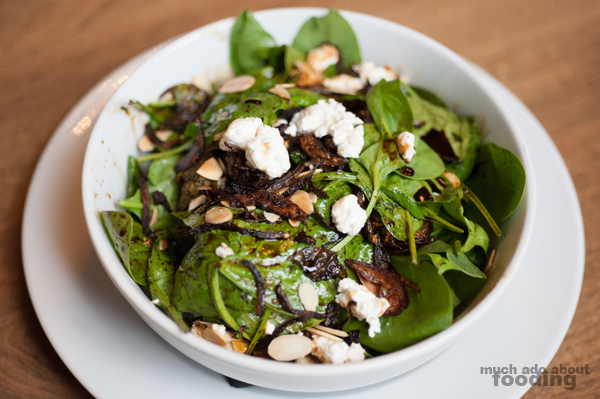 Of all the dishes we tasted, the Fried Brussels Salad ($11 - spinach, blackened shallots, roasted spiced pears, goat cheese, toasted almonds, and balsamic reduction) ended up being Duc's favorite as every component satisfied every bit of what he deems a solid plate. We really enjoyed the textural juxtaposition of wilted and crisp spinach as certain leaves were subject to the warmth of roasted Brussels sprouts and balsamic dressing. When it came to flavors, the dish played well by gliding from comforting sweet pears to fresh goat cheese to savory nuttiness to crunchy raw greens. With all of its components, this salad could definitely stand on its own for a full-blown meal. 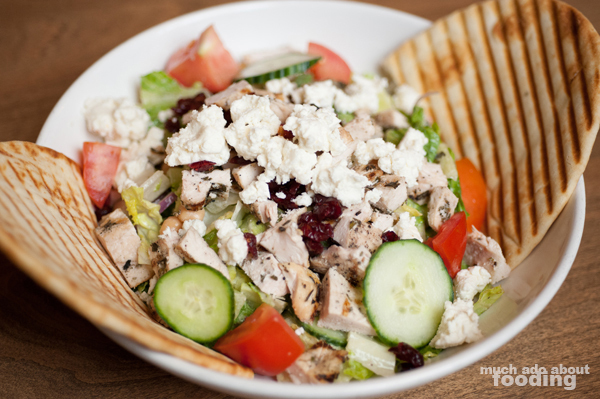 If you'd rather lighten up during lunch but still grab a salad, perhaps their Feta Chicken Salad ($15 - romaine, chickpeas, cranberries, olives, Roma tomato, cucumber, red onion, Feta, and oregano lemon vinaigrette with naan) would fit your fancy. Think "chopped salad" in style but with extra sweetness via cranberries and saltiness from the cheese. We found the chicken to be a tad over-seasoned here which was slightly distracting from the rest of the ingredients; however, it was still a solid dish to dig your fork into. If not salad, sandwiches and burgers are the other common go-tos during lunchtime, and The Federal Bar does a great job of nailing down what makes classics classics before throwing in their own flair to elevate the meal. 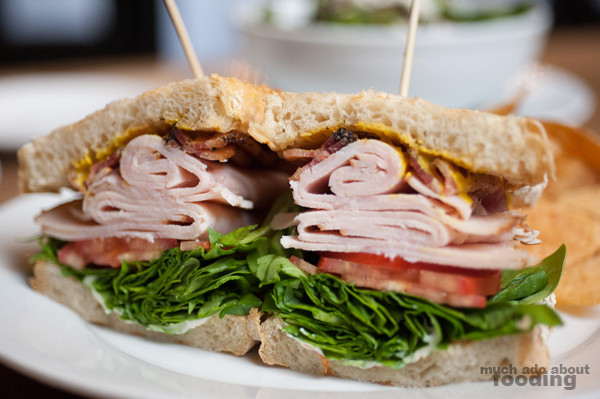 One bite of the Turkey Club ($12 - smoked turkey, pepper bacon, spinach, tomato, mayo, and mustard served with house salad OR kettle chips; add $2 to substitute for fries) made us appreciatively nod at each other at a well-made sandwich. Stacked tall and proud, each half was bounteous in its ingredients and bold in flavor. We especially enjoyed the thick slabs of pepper bacon that added the right amount of saltiness and fattiness to the sandwich. The other plate that deserves a nod is a burger done well - The Federal ($13 - garlic chips, smoked Cheddar, Bibb lettuce, black peppercorn aioli, and balsamic onion on a milk bun). 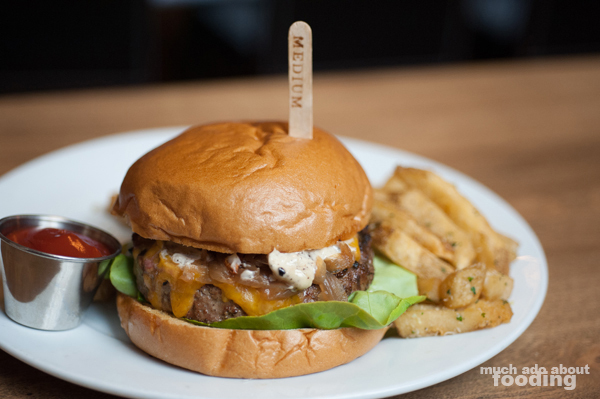 It is smoky and very savory but also oozes with craveworthy, unctuous cheese and aioli. This bad boy comes served with a choice of house salad, house fries, or kettle chips but the choice is clear: if you're going to indulge, indulge. The crunchy, garlickly fries are a fantastic accompaniment to the heft of their burger. The lunch menu at The Federal Bar is not shy of appetizers however. 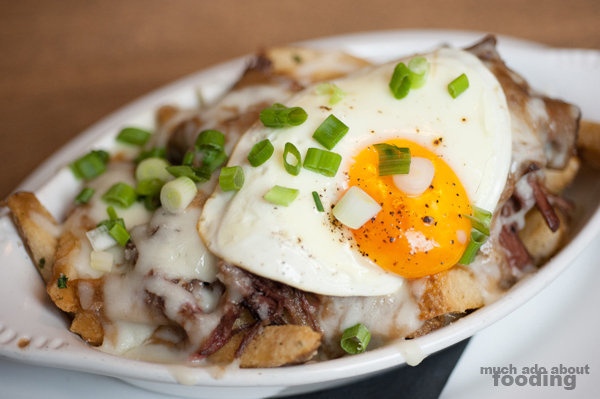 When you're out and need something shareable with your group, you might want to take a pick at the Short Rib Poutine ($15 - house fries, short rib, gravy, Mozzarella, and scallions; add a free-range egg for $2 more). It's nearly over-the-top to be honest but that's why it's not your full meal. 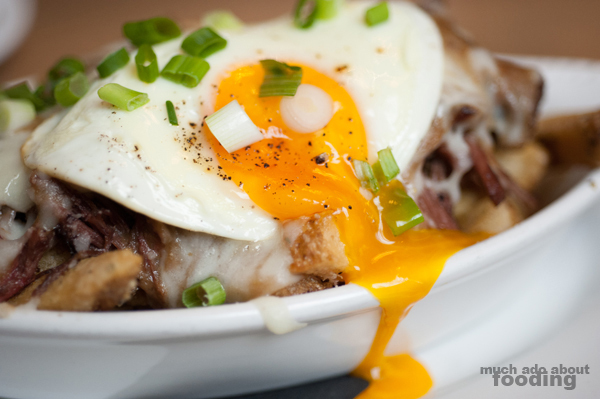 Pull your fry away from all of the cheesiness and delve into the rich, smoky short rib that generously tops the whole dish. It certainly is not for the faint of heart, and we had a hard time working on it ourselves. Worth it though? You definitely need to love cheese and fries. Wait, who doesn't? Look for The Federal Bar at 102 Pine Ave, Long Beach, CA 90802 and let us know what you think!